Information regarding how wolves communicate in packs. Please remember that the term "Alpha" is outdated and used only within captive packs. The more proper term of "Dominant" is used. Wolves have many ways in which they behave and communicate with each other. Wolves have a variety of expressions and moods that can be defined by subtle body movements like a shift in body weight to more obvious ones such as rolling on their backs on the floor in a submissive position. asserts the wolf's rank to others in the pack. A dominant wolf may stare at a submissive one, pin it to the ground, "ride up" on its shoulders, or even stand on its hind legs. During active submission, the entire body is lowered, and the lips and ears are drawn back. Sometimes active submission is accompanied by muzzle licking, or the rapid thrusting out of the tongue and lowering of the hindquarters. The tail is placed down, or halfway or fully between the legs, and the muzzle often points up to the more dominant animal. The back may be partly arched as the submissive wolf humbles itself to its superior; a more arched back and more tucked tail indicating a greater level of submission. Passive submission is more intense than active submission. The wolf rolls on its back and exposes its vulnerable throat and underside. The paws are drawn into the body. This posture is often accompanied by whimpering. An angry wolf's ears are erect, and its fur bristles. The lips may curl up or pull back, and the incisors are displayed. The wolf may also arch its back, lash out, or snarl. A frightened wolf attempts to make itself look small and less conspicuous; the ears flatten against the head, and the tail may be tucked between the legs, as with a submissive wolf. 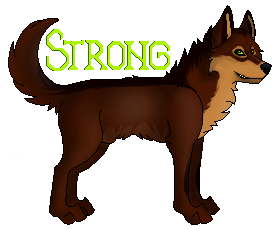 There may also be whimpering or barks of fear, and the wolf may arch its back. A defensive wolf flattens its ears against its head. An aggressive wolf snarls and its fur bristles. The wolf may crouch, ready to attack if necessary. Pulling back of the ears shows a wolf is suspicious. The wolf also narrows its eyes. The tail of a wolf that senses danger points straight out, parallel to the ground. A relaxed wolf's tail points straight own, and the wolf may rest sphinx like or on its side. The wolf may also wag its tail. The further down the tail droops, the more relaxed the wolf is. An aroused wolf's tail points straight out, and the wolf may crouch as if ready to spring. As dogs do, a wolf may wag its tail if in a joyful mood. The tongue may roll out of the mouth. A wolf that is hunting is tensed, and therefore the tail is horizontal and straight. A playful wolf holds its tail high and wags it. The wolf may frolic and dance around, or bow by placing the front of its body down to the ground, while holding the rear high, sometimes wagged. This resembles the playful behavior of domestic dogs.